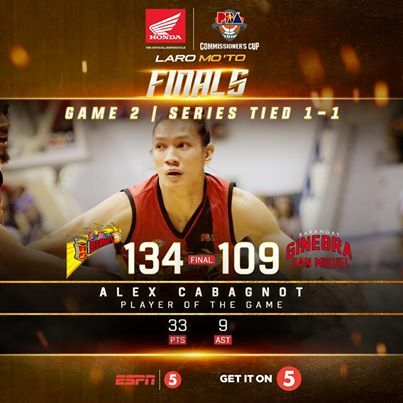 Alex Cabagnot scored a career-high 33 points on top of four rebounds, nine assists and four steals, as the San Miguel Beermen dominated the Barangay Ginebra, 134-109, in Game 2 to even the 2018 PBA Commissioner's Cup Finals on Sunday, July 29. Coming off a 5-point performance in Game 1, Cabagnot came out firing and started Game 2 by scoring 22 points in the first half to set the tone for the Beermen. The San Miguel rolled to a 29-point lead at halftime, 75-46, as they exacted revenge on the Gin Kings by preserving their double-digit lead until the final buzzer to avenge their painful 99-127 loss in Game 1. Five other Beermen finished in double digits June Mar Fajardo with 25 points and eight rebounds. Christian Standhardinger, Marcio Lassiter and import Renaldo Balkman contributed with 20 points apiece. Arwin Santos, who was ejected from the game with 10:18 after an apparent hit on Ginebra guard Scottie Thompson, contributed 14 points. Chris Ross was also thrown out after picking up his second technical foul for altercation with Joe Devance. He finished with 0 points, three rebounds, five assists and two steals. After a 42-point eruption in Game 1, Justin Brownlee had 29 points, six rebounds, five assists and three steals in a losing effort for Ginebra. Thompson and Devance added 16 markers apiece. LA Tenorio recorded 13 points, four rebounds and seven assists. Game 3 is on Wednesday, 7:00 pm at the Smart Araneta Coliseum. Quarter scores: 34-23, 75-46, 99-79, 134-109 | [Game Stats].